Five local citizens were honored with Salute to Excellence awards by the Paynesville Area Chamber of Commerce at its annual banquet on Tuesday, Jan. 10, and holiday lighting contest winners were also announced. Five local citizens were honored with Salute to Excellence awards by the Paynesville Area Chamber of Commerce at its annual banquet on Tuesday, Jan. 10. The Chamber honored Peter and Lynne Jacobson as the Bosses of the Year, Brenda Schmitz as the Employee of the Year, Kay Spooner with the Community Service Award, and Dugan Flanders as the Outstanding Young Person. 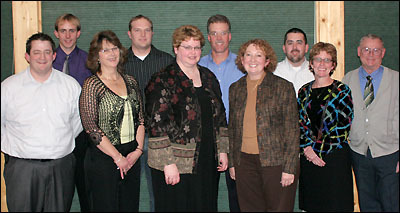 The board for the Paynesville Area Chamber of Commerce for 2006 includes: (front) Doug Miller, Doris Wendlandt, president Sheryl Fuchs, Rita Brossard, secretary/treasurer Kay Spooner, and Bob McDaniel; (back) vice president Jeb Johnson, Lance Louis, past president Dave Currens, and Tim Miller. Not pictured are DuDonne Andrie and Celia Frieler. In addition, it included thank yous from the current royalty Miss Paynesville Lindsey Pelton, First Princess Kayla Nelson, and Second Princess Tanya Whitcomb as well as entertainment and the election of chamber officers for 2006. Winners of the first holiday lighting contest were also announced. In the residential division, the winners were Chuck Steinhofer, first place; Cecil Gjelhaug, second place; and Larry Alstead, third place. In the commercial division, the Central Minnesota Federal Credit Union took first, the Blessing Well took second, and Beyond Basic took third. In their 32 years of ownership, the Press has won numerous state and national awards for its journalism, including winning the first Mills Trophy (as the best weekly newspaper in Minnesota) in 1983. 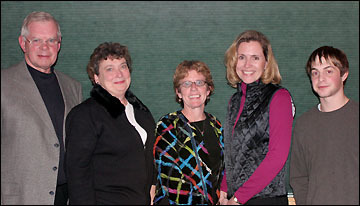 Their nomination for Bosses of the Year included reasons such as: offering independence and flexibility to employees; valuing ideas and suggestions; treating employees like family; being family friendly; leading by example; being willing to do any job; and helping employees outside away from work, said ad manager Ann Johnson. Salute to Excellence award winners announced at the Chamber banquet last week were: Peter and Lynne Jacobson (Bosses of the Year); Kay Spooner (Community Service Award); Brenda Schmitz (Employee of the Year); and Dugan Flanders (Outstanding Young Person). Brenda Schmitz has worked as office manager for Flanders Realty since it opened in January 2002. She has worked with realtor Pat Flanders for over 15 years in all. Schmitz, a 1985 PHS grad, handles a variety of tasks as office manager, everything except sales, she said, from keeping the books, answering the phone, making appointments, and updating their website. Flanders nominated her for the award because of the sense of ownership she exhibits on the job. She is willing to find tasks and accomplish them to contribute to the business's success. He listed her character traits as loyal, trustworthy, innovative, confidential, enthusiastic, supportive, humorous, modest, capable, consistent, conscientious, honest, and trustworthy (with trustworthy intentionally listed twice). "If one can fully trust an employee," said Flanders, "everything else will fall in place. She has earned my complete trust." Kay Spooner, who serves as the secretary/treasurer for the Paynesville Area Chamber of Commerce and represents Paynesville Township on the Paynesville Area Hospital Board, was recognized with the Community Service Award. In addition, Spooner has been active on other boards, including the Paynesville-New London-Spicer Hockey Association. "Whether it be making and giving quilts to the victims of Hurricane Katrina, taking tickets at a benefit dinner, or working with people with autism and other special needs, this person can always be counted on," said Chamber board member Doug Miller in reading her nomination. Dugan Flanders, a junior at PAHS, was named the Outstanding Young Person by the Chamber. Flanders, the son of Mike and Jo Flanders of Paynesville, is a cross country captain and three-time letterwinner in track; plays in the band and sings in the choir (receiving superior ratings in competitions); can be found on stage in drama productions and in one-act play; volunteers at St. Louis Catholic Church as both a mass server and in helping with Kid's Night Out; was a member of the middle school student council; helped stage a mock automobile crash last spring at PAHS; and works at H&L Express and as a riding instructor at Flanders River Ranch. New principal Lorie Floura said that Flanders exemplifies why she chose to come to this community. When she needed to choose a student leader to be a facilitator at Prairie Woods Environmental Learning Center, his name was repeatedly mentioned by teachers. "Dugan serves as a role model and friend to many students at Paynesville Area High School," said Floura, on behalf of the school administration. "He is always ready to help those in need and volunteers with a smile on his face. We believe he is deserving of this nomination for demonstrating all the fine qualities of the youth that District #741 is proud of."